My interest in native wetland plants was sparked by seeing the impact that purple loosestrife (Lythrum salicaria) has had, initially on Wisconsin and now on other states. Although beautiful, it crowds out native plants that provide food and shelter to wildlife. Attempting to control it is costing governments a small fortune. At the outset I thought that the best way to combat the intentional introduction of invasive alien plants was to find native alternatives. Pursuing that logic we have been evaluating dozens of wetland plants native to the north central United States but there is one major flaw in the idea. Many people don't seem to care if an alien plant they place in their water or bog garden seeds itself over vast areas and becomes a noxious weed. An example of this attitude is a young man who came to our place specifically seeking purple loosestrife to be planted around his pond. After I explained that we refused to sell it because it was an invasive noxious weed, but that we had several native relatives that were as attractive and non-invasive, he expressed no interest and instead asked if I knew of anyone who would sell him the plant he wanted. Although it is illegal to sell purple loosestrife in most states, including ours, I'm sure the young man can find it if he tries and I fear he will. Purple loosestrife is a nightmare when it comes to invasive alien plants. One plant can produce millions of up to 99% viable seeds a year that can be distributed by wind, water, wildlife or by hitchhiking on cars, boats or pants cuffs. It can also spread vegetatively via rhizomes or trampled or buried stems. We grow winged loosestrife (Lythrum alatum) as a native alternative but even that is not a foolproof solution since purple loosestrife from the stand the young man may well establish could cross with it to produce an invasive hybrid. Stachys palustris (marsh hedge nettle or marsh woundwort) tops my personal list of native plants to be avoided because it is invasive. Although it isn't listed as an invasive weed, it has definitely become a problem for us. At first, growing happily in a few pots, it seemed to be a perfect marginal with attractive leaves and a long blooming season. It attracted bees and butterflies and, although I haven't tried them, the roots are supposedly edible. When a few popped up where I was dumping dirt from pots I wasn't concerned, but all too soon they were growing out of crevices between pools and our barn, out from under a deck, in pathways between pools and sprouting in many pots containing other marginals. Customers buying marginals sometimes complain when I carefully remove a Stachys sprout from the pot of a marginal they are purchasing but I usually say, "trust me, I'm doing you a favor". Careful removal is important because any bit left in the dirt will resprout, as will any piece of stem broken off. Pieces broken off and left floating in pools tend to find places to root or will grow happily floating if they don't. Stems that fall over also form roots, much like umbrella palms (Cyperus alternifolius) do. The only thing that prevents me from thinking that I'm responsible for a regional Stachys invasion is the fact that none have turned up in or around our earthen pond located a couple hundred feet from the infected area. An extremely invasive plant that did find its way to our earthen pond, thanks to our introducing it, is floating heart (Nymphoides peltata). We planted a couple near the shore of our pond a few years ago and have been fighting it ever since. Last year we were a bit lax in our efforts to control it chemically and it spread over almost the entire pond, even areas with water over 8' (2.4m) deep. As things stand I see no way to eradicate it without killing all the plants and animals in the pond and starting over. Given its potential for taking over waterways and other ponds in our area, we have stopped selling it, although we have been guilty of providing starts to people who admire it and promise not to turn it loose on the world. I have only a close up photograph of the plant but when it was taking over our pond I was more interested in eradicating than commemorating it. The effect was very similar to photographs I've seen of giant salvinia that has become a major problem in southern states. An advantage to living in an area with below freezing temperatures is that invasive plants such as Salvinias and water hyacinths (Eichhornia) do not survive winter. 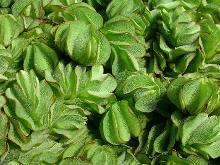 That being the case my personal experience with Salvinia molesta and Salvinia longifolia has been failure to get them to grow. Perhaps it is our hard water. Gallery by Larry Maupin Getting them to grow in many southern states isn't a problem. Lakes have been devastated, waterways clogged and businesses that depend on open water have been forced to close in many areas, sometimes as a result of plants that have escaped from water gardens. According to one website, under favorable conditions a single plant of Salvinia molesta can multiply to cover 40 square miles (104 square kilometers) of surface area in only three months. It is sad to think of the potential environmental damage that one plant escaping from a home water garden could do and even sadder to think that an ignorant person might intentionally release Salvinia into natural or man made waters. An invasive native plant that showed up here on its own is Persicaria amphibia (formerly Polygonum coccineum). Although its common name (swamp smartweed) implies that it grows only in wet areas, we find it growing happily in our gravel driveway or flower beds that are often bone dry. It is a fairly attractive plant and, when I plucked one out of the pot of a marginal a lady was buying, she told me she was buying the pot because she liked the smartweed. With that, seeing little harm in providing a native plant that is common in our area, I placed the newly removed weed in a plastic bag with a little water and said, "Here you go, no charge." Photo by Ruth Leach Water gardeners and ponders can have a positive effect on the environment but too often have a negative effect by exacerbating the spread of alien plants. In upcoming issues of WGI Online we will share results of our evaluation of native plants. 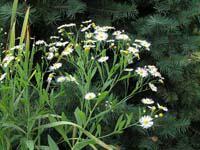 It is fitting that the first in what I hope will be a series of articles about promising native plants will be about Boltonia decurrens (false aster) because it is classified as an endangered species by states and the federal government. How great is it that water gardeners can help insure survival of this beautiful plant by growing it in their pools and ponds and making seeds available? I'll end with a few bits of advice. Contact your local or state natural resource or extension offices to find out if a plant is considered invasive prior to putting it in your water or bog garden and go online for additional information. Do not deal with businesses that sell invasive plants and report them if they are breaking the law by doing so. 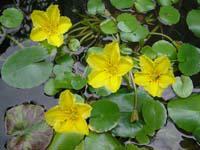 Confine plants to pots rather than turning them loose in earthen ponds. Watch for, and eliminate, escapees from pots and deadhead flowers before seeds ripen. With a little effort we can be part of the solution to plant invasions rather than part of the problem.